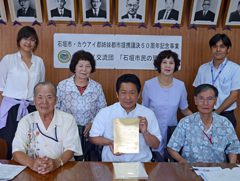 On May 7, members of the citizens’ group for international exchange activities, Wings of Ishigaki Citizens, gathered at the Ishigaki Municipal Office. On May 10, in Kauai, Hawaii, Ishigaki City and Kauai County marked the 50th anniversary of their establishing a sister city relationship. The Ishigaki Municipal Government and Kauai Community College exchanged memorandums on international interaction to commemorate the anniversary. The municipal government organized a citizens group called Wings of Ishigaki Citizens to carry out international exchange activities. The group members deepened exchange on a six-day visit to Kauai. On May 1, 1963, the assembly of Kauai County unanimously passed a resolution to establish a sister-city relationship with Ishigaki City and sent this to the Ishigaki Municipal Government. The Ishigaki Municipal Assembly subsequently passed a resolution to establish a sister-city relationship with Kauai County on May 23 that same year. However, exchange between both municipalities became stagnant through the years because the merger between Ishigaki City and former Ohama Town drastically reduced the number of personnel in the municipal government and assembly. As a result, there was no real exchange between two municipalities until 1999, when they resumed activities and now continue this in the form of exchange programs for junior high-school students.